2 Departments of Pediatrics, Ondokuz Mayıs University Faculty of Medicine, Samsun, Turkey DOI : 10.24953/turkjped.2017.02.017 Kemal Ö, Atmaca S, Bel-Çeçen A, Düzgün B, Aygün HC. 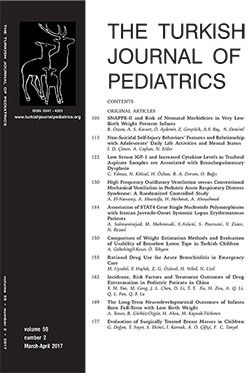 The use of nasal trumpet as a non-invasive treatment method in congenital nasal stenosis. Turk J Pediatr 2017; 59: 210-213. Newborns and infants are dependent on nasal respiration and therefore, nasal obstructions may lead to life-threatening outcomes in this age group. Although the most common cause of nasal obstruction in newborns are choanal atresia, soft tissue edema, congenital nasal bone anomalies such as narrowness of the apertura piriformis and midnasal stenosis should be kept in mind.